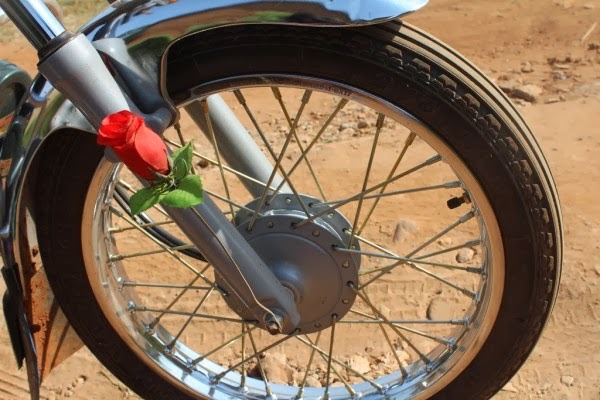 Bodaboda Baby: The day I went to my boda driver's home, three weeks after meeting him. 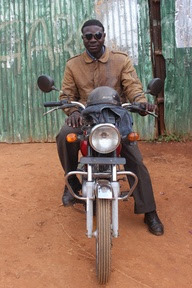 The day I went to my boda driver's home, three weeks after meeting him. 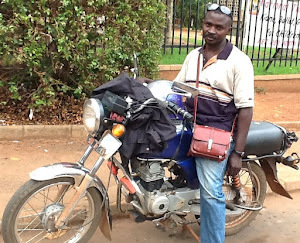 Boda driver Ali spent two months in a Kampala hospital with a broken leg after a car knocked him off his bike. 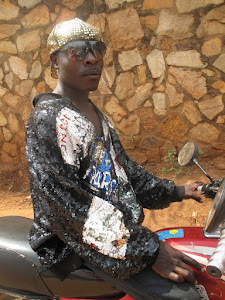 For some reason I don't imagine any of my boda drivers doing things like getting dressed up, going to church and getting married - they seem way too tough and cool for all of that stuff. 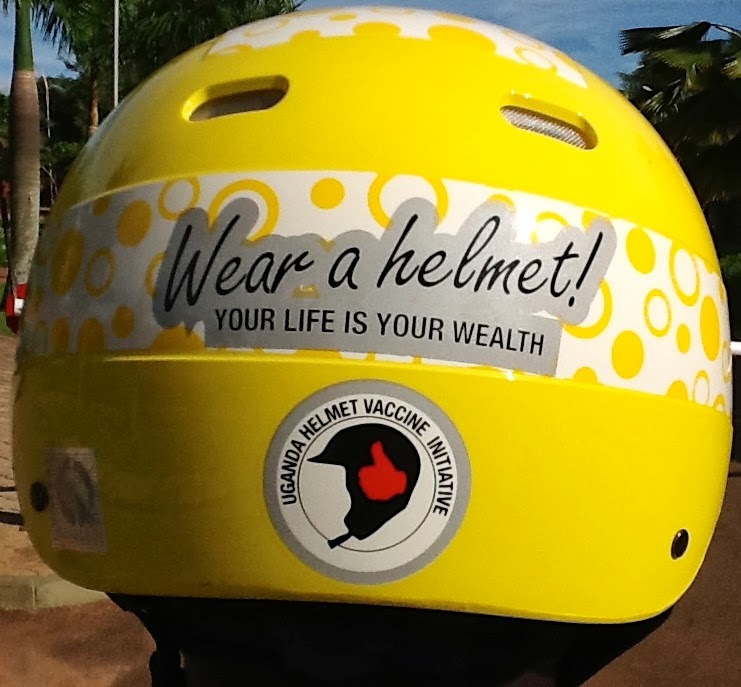 And I picture them glued to their bikes, as many do long hours on the roads. 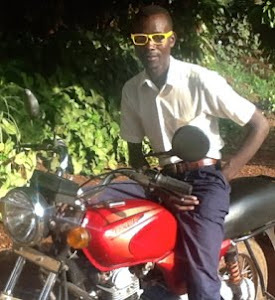 But here were the photos of my new rider Ali to prove it. There was the shot of him, his new wife Patience , whose dress would put those on My Big Fat Gypsy Wedding to shame, sitting on his lap at their January 2011 nuptials. 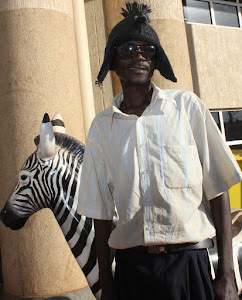 Alivas Niwamanya, who I sometimes think only looks about 12 but is actually 25, putting cake in Patience's mouth. In another snap they are proudly posing with the wedding party, Ali holding their marriage certificate. But these weren't the photos that stuck out the most to me when Ali, my driver of just three weeks, invited me to his home in Kyebando, Kampala, where his wife immediately thrust their family album into my hands. Sadly the snap that I remember most is the one above of my driver with a leg in his cast after a car knocked him off his bike last September. 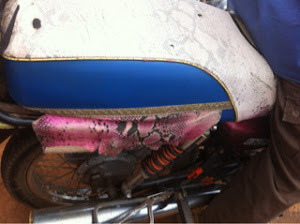 Ali, who luckily was wearing a helmet and escaped more serious injuries, has kindly let me take a photo of this and post it here to highlight the dangers of boda accidents. 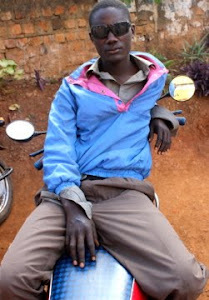 I learned about my new boda driver's accident after he invited me to his home in Kyebando, Kampala, last week. 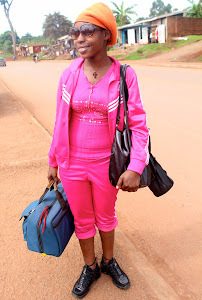 "I was in Makindye (Kampala). The car (was to blame). 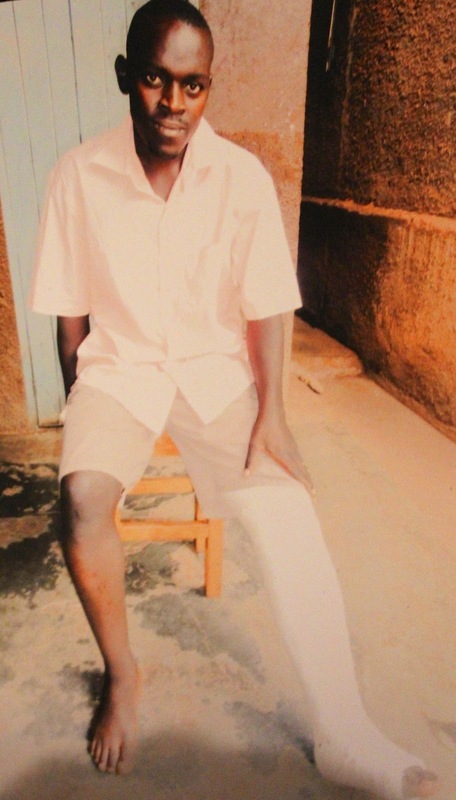 I went to Mulago (Hospital), the police took me there," he told me, sitting on a stool in his one bedroom home, which he rents for 100,000 Ugandan shillings a month ($USD 38). "I was there in the hospital (for) two months. After two months they told me to go back home and be reporting back there, to the hospital. I could not walk, I could use those sticks. I lost some money because I could not work." 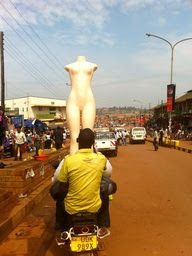 Patience at the time was in the village in Kabale, western Uganda, where the pair are originally from. She doesn't work. 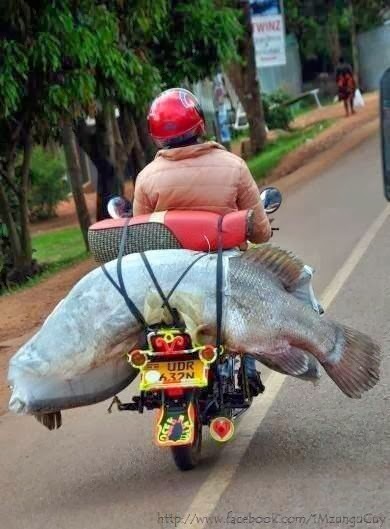 On a good day Ali can take home 50,000 UGX; usually it's 30,000. Happier times. With wife Patience and three-month-old daughter Precious. 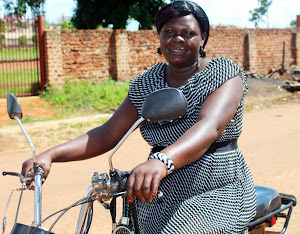 When she heard the news about her husband, Patience rushed to Kampala to be by his side. "The bike was also broken. 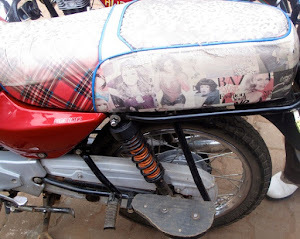 I had to buy a new one and it cost three million shillings ($1,154 USD). 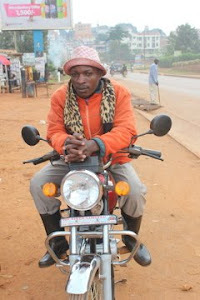 Someone gave me the money," recalled Ali, who moved to the Ugandan capital in 2000 for school and has been driving a boda for two years. 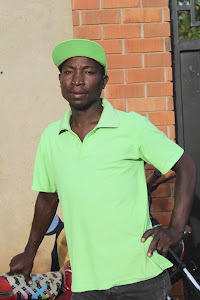 "I lost a lot of money, I could not work. There is a certain friend of mine who borrowed me some money. He told me when I be okay I will return back his money." Ali sporting the electric blue helmet he bought for yours truly a few weeks ago. 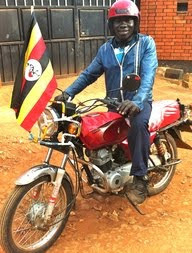 Ali said several of his friends who work as boda drivers have had accidents. "The cars knocked them," he said. "I have to drive slowly slowly so I cannot get an accident." When I asked if he liked his job Ali replied: "I like it, because I don't have another job. I have to like it." If in the future he can "get money" he says he would like to start a business, like a small shop. "Then I can buy land and build a house," he said. Ali says he cannot afford to have another accident now he is a father. 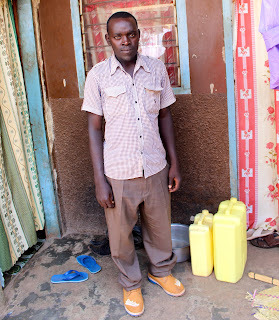 This is extremely important to him now he's a father to baby Precious, born December 27 last year in the same hospital Ali had been admitted to after his boda accident. Although Precious didn't warm to me when I met her ("she's fearing you," Ali kept on saying), it seems I did leave a good impression on Patience. "Do you know what she told me that night?" Ali informed me several days after my visit to his home. "She told me we should go with you in the village. "She wants the parents (her parents) to see you." Watch this space. But it's safe to say (no pun intended) that as long as Ali keeps wearing his helmet he will be a favourite driver of yours truly, and she may pay his in-laws a visit. Another accident may mean he cannot work, which will mean loss of income. Ali's family cannot afford this. ...bringing out the real stories of these people is touching, and shows resilience in times of despair. For you to live their experience for that little time is inspiring, and I must commend you Amy. 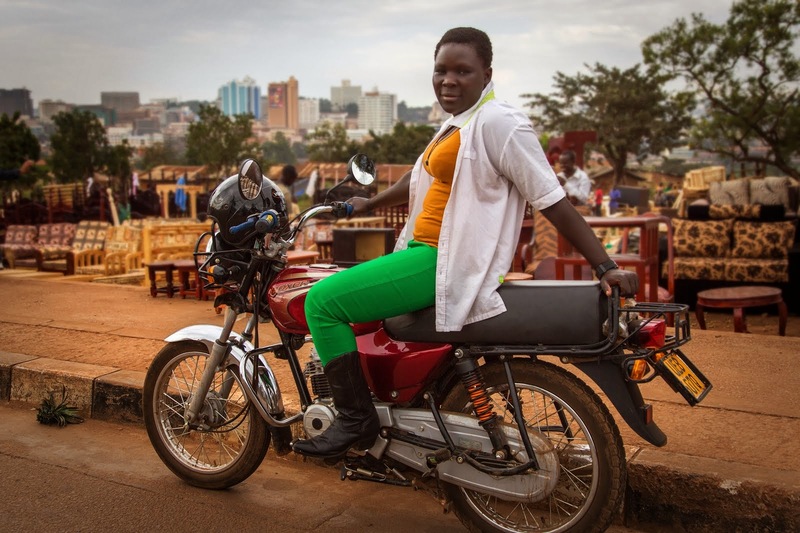 The hope is that your readers can get insights about the simple lives these boda bodas live and be more empathetic and understanding when engaging them. 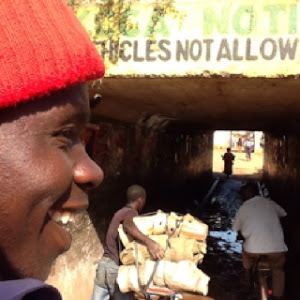 One thing Ugandans have failed to change is using the word BORROW instead of LEND, e.g. "He borrowed me the money"... Lol. Amazing! 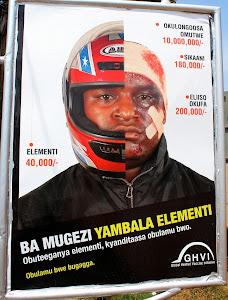 Fantastic way to highlight the plight of the boda boda drivers! 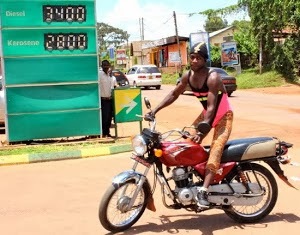 Sometimes we tend to forget that they are fathers, husbands, brothers and uncles who are struggling to eke out a living, by undeertaking such a risky job of driving the boda boda! Nice way to highlight their fears and concerns, as a way to try and improve their safety.